The box is available for £9.99 and brings the benefits of Web TV to any television. Customers can enjoy ongoing access (sans contract) to BBC iPlayer, Sky News, Demand and the BBC News App. That’s in addition to Sky’s own Now TV service, which features notable channels like Sky Sports and Sky Movies. The Box — which measures 8.4cm x 8.4cm x 2.4cm — plugs in via an HDMI cable and, once connected to WiFi, is up and running. It’s similarity to Roku, couple with Sky’s $11.9 million stake in the media company, suggests the device may be a white-labelled version of the Roku player. 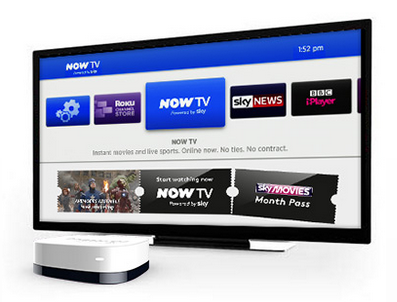 Launched in 2012, Now TV offers Sky channels via a more flexible monthly subscription plan. It finally brought Sky Sports into the mix in March this year, letting users access all its main sports channels for £9.99 for 24 hours — a price that may not appeal to all but represents an alternative offering to a full-on Sky subscription.